If there’s one principle a good political comedian like Seth Meyers operates on, it’s intellectual honesty. Which makes Fox News—cable news’ black hole of intellectual dishonesty—a prime source of material. 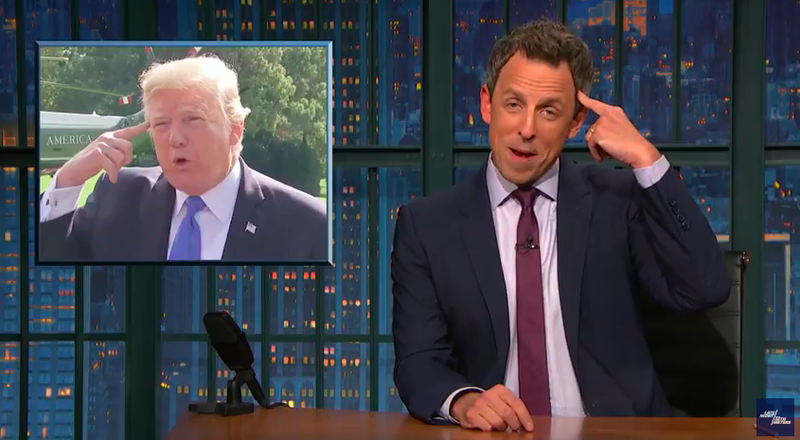 On Thursday’s Late Night With Seth Meyers, the host employed Fox News’ kryptonite—Fox News broadcasts—to show how sweatily those remaining Fox News figures not fired for sexual harassment are leaning into “an alternate reality where Trump isn’t actually president” in order to shore up the collapsing defenses that threaten to actually make Donald Trump not the president. Yup, with the Russian collusion scandal not going away and Robert Mueller, a guy who looks like he sleeps “in a rocking chair holding a shotgun,” clearly advancing on a growing list of figures in the Trump administration like the Terminator with a bandolier filled with subpoenas, America’s own version of state-controlled media is latching onto favorite target Hillary Clinton once again. This time, the fraying reed that Fox is clutching is the report that the infamous (and increasingly verified) dossier of potentially treasonous and impeachable Trump-Russia collaboration fun facts was funded by the Democrats—including that darned Clinton! And it was. Boom! Oh, except that, as Meyers spells out (extra slowly so Trump’s base can keep up, if facts and evidence mean anything at this point), the opposition research on the Trump campaign was initiated by other Republicans. Oh, and abandoned once stuff started turning up that could harm Trump once it became clear he was gaining momentum in the race. And that doing opposition research is in no way illegal, or in any way equivalent to, say, a presidential candidate’s campaign reaching out to a hostile foreign power in order to undermine the legitimacy of an American election. Especially when that research is intended to uncover that collusion. These are not hard points to grasp.